The MidWest Universal Crate Caster is designed to fit most wire crates by attaching to the intersection of any two cross wires. 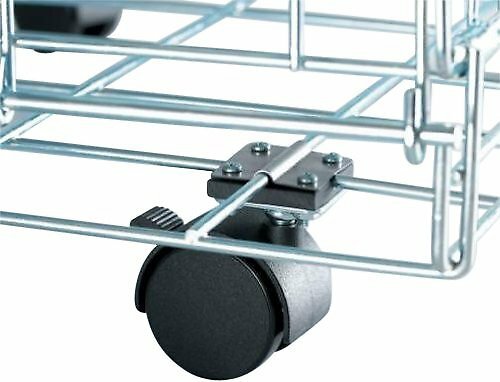 The casters provide portability and ease of movement with easy rolling, locking casters and come packed with two casters. Why two per pack? MidWest suggests that you use only four casters on crates 30 inches or smaller, however on crates 36 inches and higher, six casters may be necessary in order to support the additional weight. 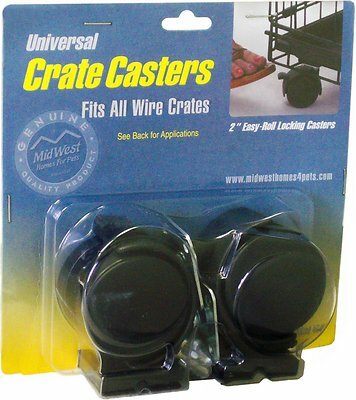 Make any crate mobile by adding these casters. These wheels work well. I used them on a crate that I had to wheel from the parking lot into a building for an AKC show. My mini schnauzer was also in it at the time. I wish they made ones that would only go in a straight position so I could put them on the front. This would keep the crate from going side to side while pulling. But, I still feel that these are well worth getting. It took me about 45 minutes to put them on. Make sure your working on a surface that will be easy to retrieve the tiny nuts and bolts that slip out of your fingers! Be weary if you have a large dog. We bought 2 sets for our 70lb pit-mastiff pup, who is the Houdini of breaking out of crates. The wheels only lasted less than an hour before he was able to knock the crate over and break the wheels.. As a result, our wood floors were scratched. Work exactly as expected. little fiddly to put together but simple enough. Easy install and I can roll the crate out of the way for carpet/ floor sweeping. I also roll the crate into other rooms. Did not work on the crate. The kept flipping around bar and wouldn't stay straight in order for the crate to sit on the wheels. I also didn't get any of the screws that said they were included. 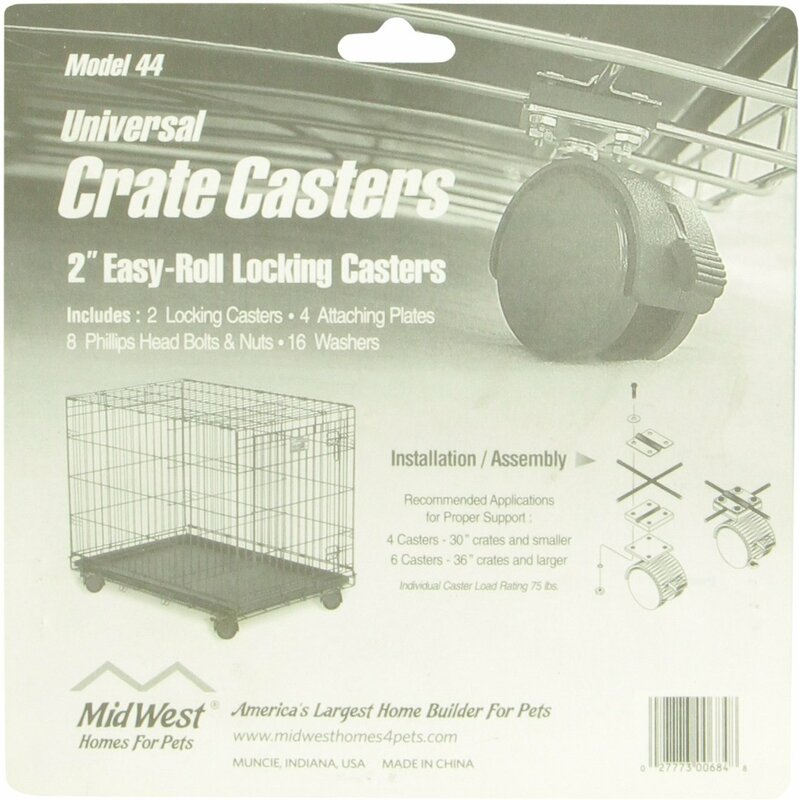 Great casters, makes having a pet crate in your home easier to move about for cleaning and such, but these are a job to install! Definitely tests your manual dexterity skills holding the caster, placing the plates on, inserting the small screws with the teeny tiny washers and nuts and then tightening all of the above while trying to keep all the pieces together and the wheel out of your way. Other than that, they're good quality and they do the job. And Chewy.com, as always, great! Thank you. Purchased 27” Skudo Plastic Pet carrier. It’s large/bulky enough that wheels are needed. We were surprised it didn’t have built-in wheels; further surprised when the “Universal” wheels came in 2-packs so had to buy 2; then have not been able to install after lengthy time trying but caster package all apart so unable to return. These castors work great, and it's so much easier moving the crate. BUT....when installing them, I realized the bolts were too long, and therefore would rub on the castor fender, and make them hard to swivel. I added more washers, and that solved the problem.